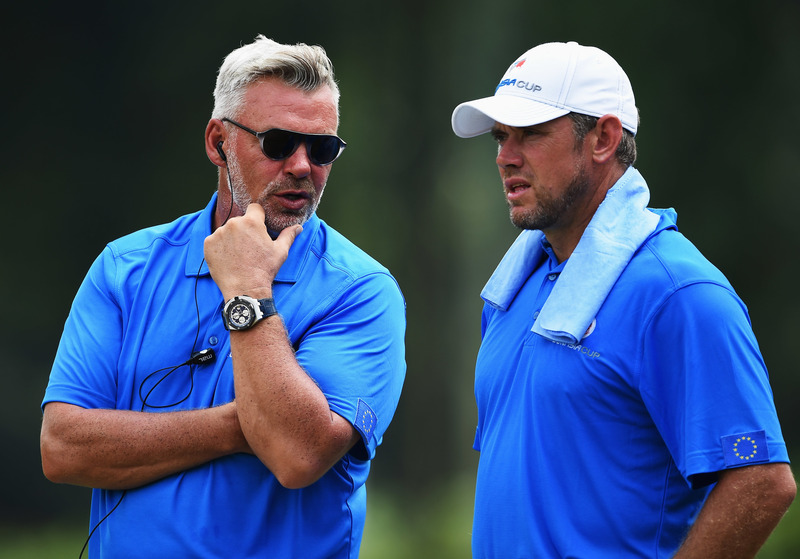 Thick as thieves - Darren Clarke and Lee Westwood. You can be pretty sure that if Lee Westwood says anything controversial in the build-up to the Ryder Cup it will be on the say-so of his captain. Everyone knows that Westwood and Darren Clarke have been best pals for years and years. There’s no way he would stir the pot without the two of them having a chat beforehand. So, I reckon we can assume that Clarke is quite happy that his mate has started throwing grenades. Westwood has spoken about the potentially “adverse” impact Woods could have in his role as vice-captain. For what it’s worth, I think he’s right. Woods hasn’t been known as the best team player, so it must be a real doubt whether he will be a positive or a negative force in the locker room. But the more interesting thing is Westwood being a bit provocative. In the interview he also spoke about the American captain Davis Love III and his wildcards. I think we can take this as a sign that it will be a European tactic to try and niggle away at the Americans before Friday and turn up the pressure. Paul McGinley didn’t really need to do it, but his team looked stronger and he had home advantage. Whether it’s keeping quiet like McGinley or stirring things up like Westwood, I can’t remember the European captains or players doing anything that has undermined their cause in recent Ryder Cups. Apart from Nick Faldo, they always seem to get it just about right. The Americans on the other hand, find new ways of shooting themselves in the foot. The way they tore each other apart in the post-singles press conference at Gleneagles will be brought right back to the top of the news agenda next week, and you can see potential for old wounds being re-opened. It might already have started, with Dustin Johnson saying he could partner anybody but Phil Mickelson. That’s the sort of comment, even though the two are supposed to get one well, that you could never see a European making. Past Ryder Cups have proved that the psychological stuff probably does have a bearing on the result. I would say that so far, as usual, it’s 1-0 to the Europeans. * I always seem to be in Stockholm for the Ryder Cup week. I’m still gutted that I missed Gleneagles two years ago. I’m sure I’ll be able to watch bits of it when we’re in Sweden because our coach Glenn Howard is a big golfer but it’s never the same as watching it on your own sofa! It’s been a really positive start to the season for us – two tournaments and two finals. Both have gone to the last stone and Sunday’s final was really high quality curling from both rinks. One of the best bits about going far in both competitions is we’ve now played 17 games and all the fitness work in the summer and practice is paying off already. I also think we’ve put down a marker. With a new coach and two new team members the other teams will have been looking at us to see if we would be back to square one. But we’ve shown that we’ve been able to keep the momentum going of the last couple of years. That can only bode well for the rest of the season.